Reliance Jio has launched a new 4G feature phone at a low cost, called JioPhone. As i said earlier, companies will be releasing 4G feature phone that support only 4G LTE/VoLTE. 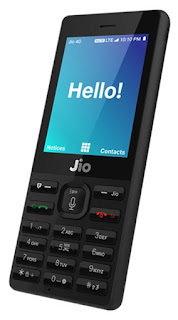 Now, just about ten months of launching Reliance Jio (an Indian service provider), they are set to release their own branded 4G feature phone -JioPhone-. As we all know how boring 4G feature phone can be, if you ask me, i can't use a 4G feature phone. But Reliance is making this phone so special. Let's see what's the deal here. Reliance is making this phone totally free. Yea! free; i will explain better. The JioPhone will be available to customers starting August 24, 2017. Customers will have to pay INR 1500 ($23) up front, which will be refunded after three years of using the phone when the phone is returned, essentially making it free. As usual, local calls and SMS over Jio's 4G VoLTE network are completely free of cost. 4G data will cost INR 153 ($2.38) per month and will include 500MB 4GB data per day. Exceeding that will reduce the speed to 128Kbps until it resets the next day. I hope this phone support java application?